Whether you are entertaining at home, or whether you need to bring an appetizer to a party, it can be stressful to figure out what to make. Creating a tasty appetizer doesn’t have to be time-consuming or expensive. Just as you can make a delicious dinner with frugal substitutions, you can create a party-worthy appetizer with a few minutes and a few dollars. Chances are, you have many of the ingredients you need at home. 1 cup grated cheese. You can use cheddar for a classic cheese ball. Use sharp cheddar for an extra kick. Use a food processor to blend the cream cheese, shredded cheese, pepper and salt. You should need no more than 10 seconds to do this. Then, transfer the mixture to a bowl and set in the fridge. After the allotted time has passed, it should be fairly easy to handle your mixture. Create balls the size of large marbles out of the mixture; you should be able to get 30 to 40 of them. Of course, you don’t have to do mini cheese balls. You can use this to create two or three larger balls that guests can use for crackers or chips. For a variation, you can add in 1 tsp cayenne pepper at the food processor stage to make the cheese balls spicy. If you want, you can crush walnuts or almonds to cover the outside of the ball. Roll each cheese ball in the nuts. This is one of my favorites. I love to make this quick, simple appetizer. All you need is a package of mozzarella cheese (not shredded), a couple of tomatoes, and several basil leaves (I like to use fresh basil from my herb garden). You will also need some olive oil (I like to use extra virgin) and some salt. 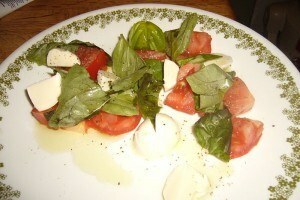 Cut the mozzarella and tomatoes into slices, and wash the whole basil leaves. On a plate, lay out the tomato slices. Put a slice of mozzarella on each tomato. Next, put a little oil and a little salt on top of each cheese slice. Top with a basil leaf. Quick, simple, and inexpensive. Pancetta Bread Twists: Uses pizza crust dough that you can get at a variety of stores. You do need to do some baking, in addition to the five-minute prep time, so the total ends up being about 10 minutes. Hummus: With the help of a food processor, hummus, a tasty dip from the Middle East, is quite easy to make. Goes well with crackers, veggies and homemade pita chips. Ham Roll Ups: Great for use with leftover ham. you will have to allow this appetizer to chill for an hour before you serve. You can also saute veggies (for five minutes) while you prepare couscous (also takes about five minutes) then throw it all together for a quick and healthy meal / appetizer! Mmmm.. I love anything with cheese and fresh herbs. Both can be purchased for under $5 with the right timing of sales and a visit to your own garden. Love the tips!